In the life of Mustafa Kemal, World War I was a pivotal period, during which time he had emerged as a military hero when he repelled an Allied invasion during the Gallipoli campaign of 1915. This successful military campaign earned Mustafa Kemal a distinguished military reputation and wide-spread admiration. In 1918, when Mustafa Kemal returned to Istanbul to find it occupied by British and French forces he began to organize the Turkish army into an organized resistance movement to save the Turkish homeland. The Allies sought to impose a peace settlement on the Turkish people that afforded to them a mere rump state centered around Ankara. 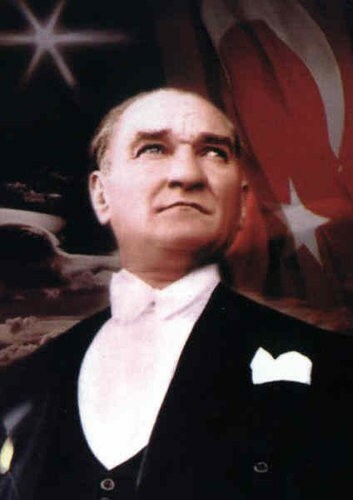 In response, Mustafa Kemal formed the Grand National Assembly of Turkey. The new Parliament moved quickly to assemble an army that would serve to launch the Turkish National War of Liberation. The War of Liberation was fought on multiple fronts. Throughout 1921, under the leadership of Mustafa Kemal, the army of the Grand National Assembly won victory after victory against invading enemy forces ultimately pushing them out of Anatolia. The Allied powers of World War I now had to negotiate a new peace treaty. On July 24, 1923, the Treaty of Lausanne was signed, whereby the boundaries of the modern state of Turkey were internationally recognized. Shortly thereafter, the Republic of Turkey was officially proclaimed on October 29th- the same day on which Mustafa Kemal was unanimously elected as the first president of the Republic. In just 15 years, from the establishment of the Republic in 1923, to his death on November 10, 1938, Mustafa Kemal introduced a sweeping set of reforms which constituted one of the world’s most effective campaigns of modernization. In 1924, the office of the Muslim Caliphate was abolished, which would consolidate a system of governance based on popular sovereignty and one grounded in secularism. Education was also secularized and the use of Arabic script would be replaced with a new alphabet based on Latin. As of 1926, Islamic courts and Islamic canon law (Sharia) was replaced with a secular law structure. A new Turkish penal code, based on the Italian model, and a new Turkish civil code, based on the Swiss model, was adopted. Women had now obtained equal rights with men in private matters such as marriage and inheritance. According to Mustafa Kemal, gender inequality was an impediment to attaining the full development of the nation; without such equality, the nation would remain irremediably backward. By 1934, well before many other European nations, Turkey moved to grant full political rights to women, including the right to vote and be elected. Several female MPs joined the Turkish Parliament, with the general elections of 1935, which was a breakthrough not only within the region, but throughout the Western world. These wide-ranging reforms spearheaded by Mustafa Kemal Ataturk have left a lasting legacy of which the peoples of Turkish heritage are proud: the conversion of the newly founded Republic into today’s modern, democratic and secular Turkish state. Each year, on November 10, at the exact time of his death, most people in Turkey observe a moment of silence in honor of Ataturk’s memory and lasting legacy. Please click here to listen to the speech of President John F. Kennedy delivered in 1963 on the 25th anniversary of Mustafa Kemal Ataturk's passing.